For those unfamiliar with Star Wars – D-Tech Me, this 10-minute experience uses the world’s highest-resolution, single-shot 3D face scanner created by our Imagineering scientists with Disney Research labs. The captured image is later sent to a high resolution 3D printer to create the figurine. 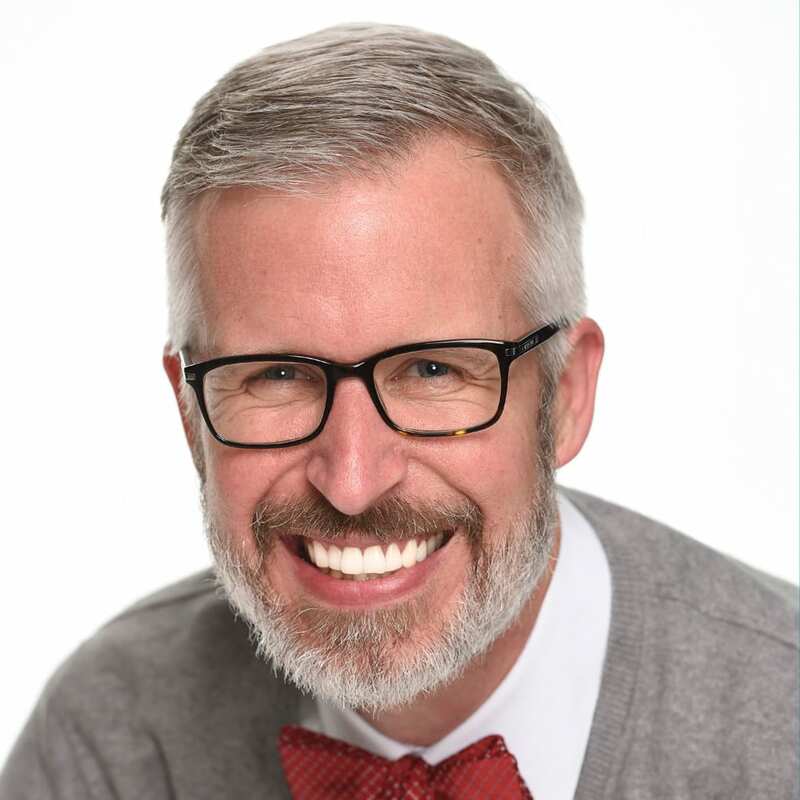 My fellow author Gary Buchanan has a cool, behind-the-scenes video about the experience as seen in this story. This year, two returning favorites – Carbon-Freeze Me and Stormtrooper – will be joined by two new figurines – Alderaan Princess and X-Wing Pilot. There are both male and female options offered for X-Wing pilot, Carbon-Freeze Me and Stormtrooper figurines. 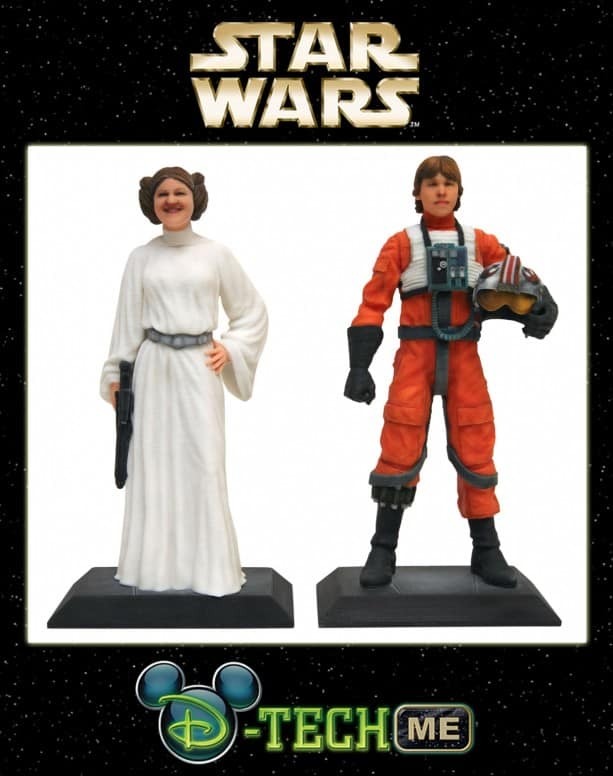 For children, Alderaan Princess and Carbon-Freeze Me figurines will be available in more youthful appearances. For the first time, we are introducing a 16-inch figurine. 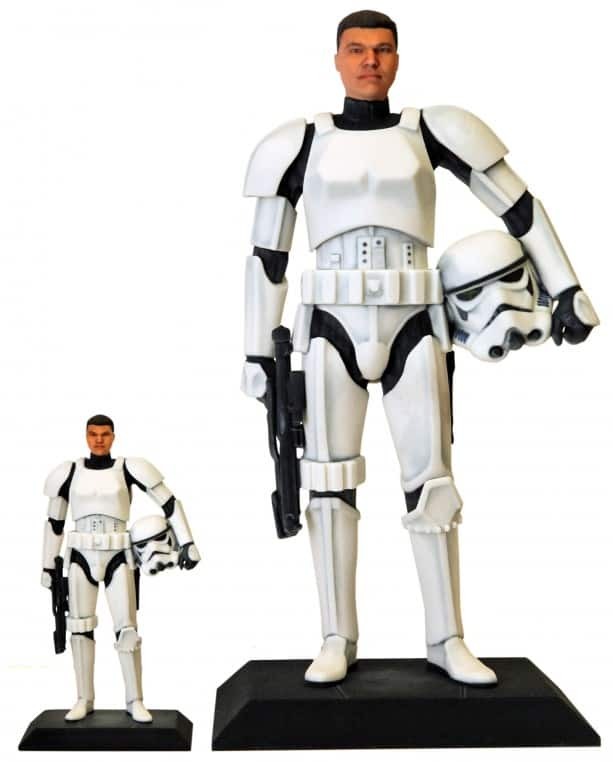 While a wise Jedi Master once said “size matters not,” you can see the size differences of the Stormtrooper figurines in the above image. Additionally, we will share details starting May 16 on DisneyParksMerchandise.com about how you can have your image from last year added to a new figurine this year. An example of this is shown above with a Stormtrooper figurine image from last year applied to the new X-Wing Pilot figurine. The Star Wars – D-Tech Me 7-inch figurines are $99.95 each, plus shipping and applicable sales tax. For the 16-inch figurines, retail is $1,499.95 each, plus shipping and applicable sales tax. All participants will receive a specially designed button. Completed figurines will arrive within 7-8 weeks after the experience if shipping domestically (it takes a little longer if shipping internationally). Finally, guests attending the Rebel Rendezvous event on May 15 will be some of the first individuals to experience Star Wars – D-Tech Me this year. Registered event guests should look for an email soon that will explain how to sign up. If you still want to go to the Rebel Rendezvous event, we’d love to have you! Please see DisneyParksMerchandise.com for more details. When will cases for iPhone 5C be available at Disney Parks? 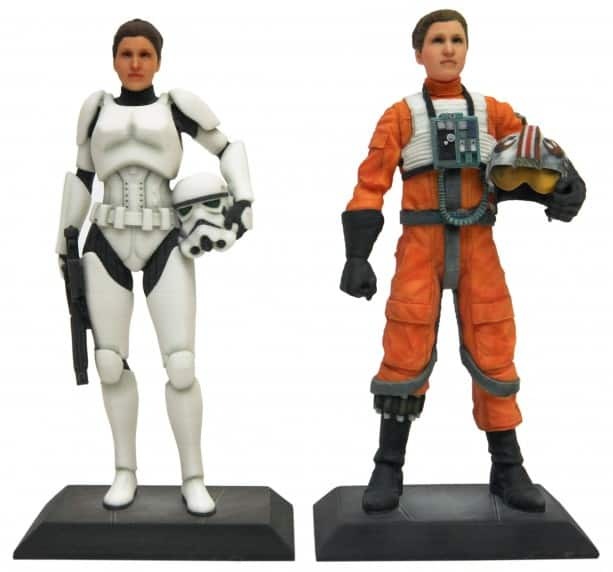 If I want a carbonite and a rebel pilot figure of me can they have different expressions? @Jeffrey – Yes! They will be happy to take different photos. They typically do a few different shots and you can select which ones you like the best. How much time should I put aside for this experience? I know it says it’s a ten minute experience, but do they usually run behind? @Rebecca – From what I’ve seen, the team moves things along pretty quickly. Since we’ve had this experience for a few years now, they have become pretty proficient. I hope you enjoy it! @ Rory: Last year it was also in “the Mall” and basically if your appointment is when it’s crowded, you tell the cast member at the door and they will get you in for your appointment. Since the experience now takes place inside of Darth’s Mall which can have long lines to get into, is there a separate entrance or way to get in so that one does not miss their reservation? 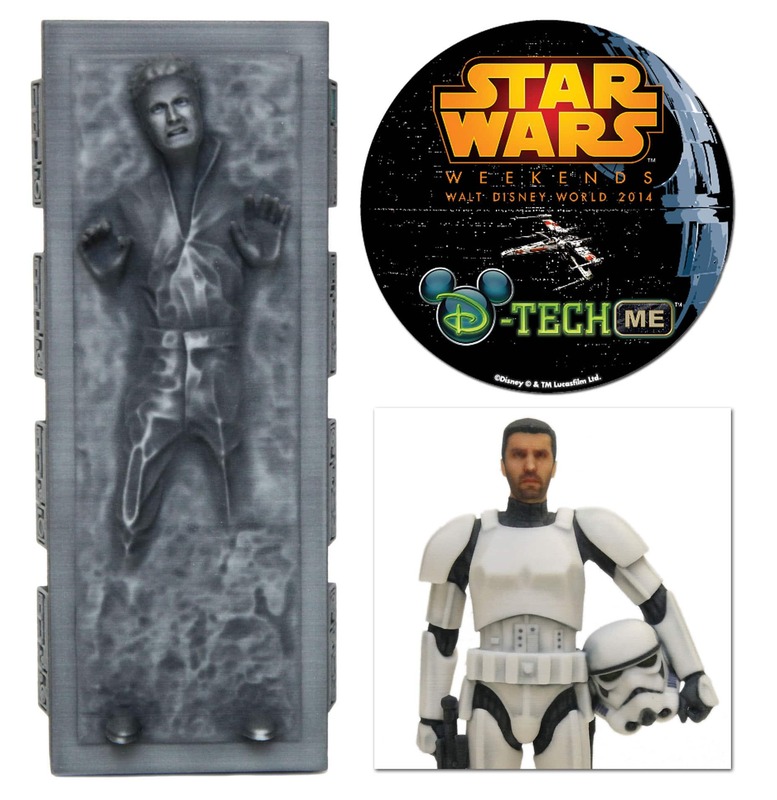 Will the D-Tech Me experience be available for Star Wars Day, May 4th? @Timothy – The experience won’t be offered on May 4. Sorry. Not to sound too nerdy, but are these action figures (with points of articulation) or mini statues? Just curious! @Michael – Not a nerdy question at all … they are more like mini-statues versus action figures. They are not posable and do not have movement. Are CMs able to get their discount on this item? @Jennifer – Unfortunately, no discounts are offered on these items. @Meghan – Not a silly question. Yes, Disney gift cards are accepted at our merchandise locations in Walt Disney World Resort. (i) Im attending RR event with my 2 yr old (will be 2 yrs + 10 months) – is this too young for him? @Dave – I have a few answers for you. 1) The expereience is really designed for Guests ages 3 and up. We can try with your son who will almost be three years old. It will depend if he is able to sit still for a few moments to get an image, and if you are happy with the captured image. The figurine is a decorative item, not a toy. 2) You won’t need to call to cancel your current order. The call was just to reserve a timeslot. When you check in at the Star Wars – D-Tech Me experience, please tell the Cast Member that you are no longer interested in the 16-inch options. I would love to get a Princess Leia figurine done. Is that available for $99.95? I thought last year the only option was for the stormtroopers for $99.95. Is a reservation required? Thank you. @Jessica – The 7-inch figures, including the Alderaan princess figure, are $99.95 each plus shipping and applicable sales tax. My best recommendation is to call 407-WDW-TECH (407-939-8324) to make an appointment. 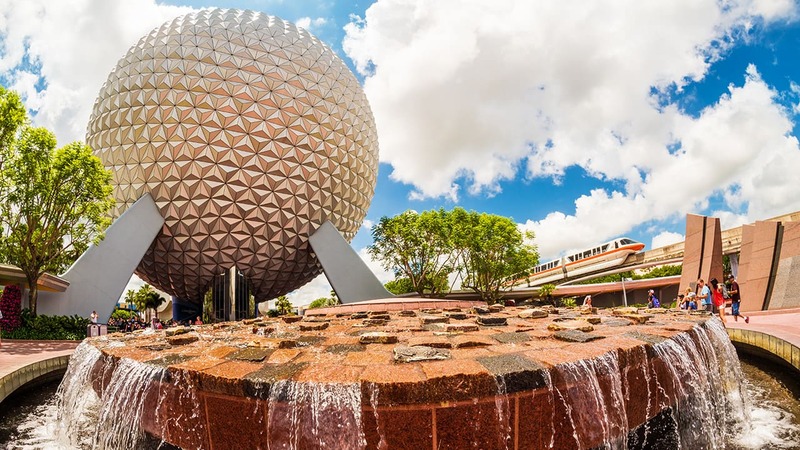 The experience will only be offered during Star Wars Weekends 2014 which are being held at Disney’s Hollywood Studios May 16 – 18, May 23 – 25, May 30 – June 1, June 6 – 8, and June 13-15. I had the Stormtrooper one done last year. I’m going to be down there again at the end of May. I’m wondering if they could start the process early using my scanned face on file… so that it wouldn’t take as long to get it shipped? @Tom – We will post details on how to do that starting May 16 on our http://www.DisneyParksMerchandise.com site. Please stay tuned. It is important to note that shipping will still take approximately 7-8 weeks from the time your order is placed. Really? A $1,400 difference between the 7-inch and 16-inch? Sheesh… I thought that price tag was a misprint. DOH! Whoa, how much now on that 16-inch figure? @Alan – Retail for a 16-inch figures is $1,499.95 each, plus shipping and applicable sales tax.